A leading governorship aspirant in Imo State, Ifeanyi Ararume, and immediate-past national organising secretary of All Progressives Congress (APC), Osita Izunaso, Wednesday, held a closed-door meeting with the national chairman of All Progressives Grand Alliance (APGA), Mr. Victor Oye, in Abuja. The two politicians who are currently engaged in running battle with Governor Rochas Okorocha for the control of APC structure in Imo State arrived at the party secretariat in Abuja at about 1.30pm and headed straight to the office of APGA national chairman. After the meeting that lasted for two hours, both men left the Secretariat without stating their mission. Ararume, however, said it was a private meeting. Izunaso also told journalists that consultations were still ongoing and that another meeting had been slated for Friday. “I can’t talk now. I have already said that. After our final meeting, I will talk. I am going to have another meeting on Friday and we will talk after that,” he said. Although Ararume did not state the outcome of the meeting, it was however gathered that the former senator may pick the nomination form of the party on Friday to contest for the Imo governorship seat. 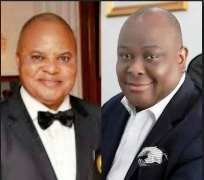 It was gathered that both Ararume and Izunaso registered as members of APGA last week in their wards in Imo State.